Providing our employees with the opportunity to build new skills, improve their job performance and satisfaction is something we are passionate about at Cube. This is why we are always looking for new training opportunities that could benefit our staff. By supporting and providing these training opportunities, we hope our employees will not only gain new skills but also build their confidence and aspirations, in order to evolve towards more challenging roles. Most recently, our Junior Finance Assistant, Sam Beese successfully completed her AAT Level 2 Certificate in Accounting, with an impressive pass mark of 96%. AAT is an internationally recognised professional accounting qualification based on practical, real-life knowledge and the course included both accounting and bookkeeping skills. Sam is now progressing onto the AAT Advanced Level 3 Diploma in Accounting in order to develop her skills further and progress her training to the next stage. 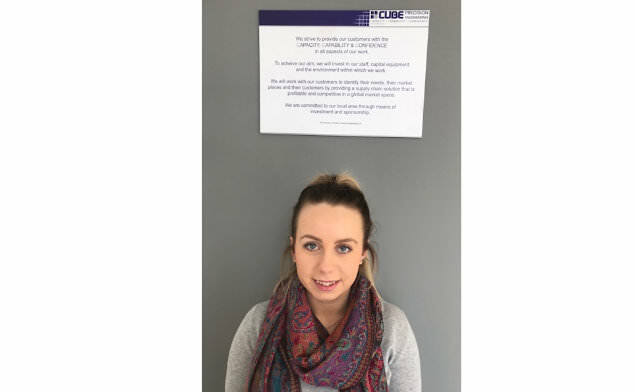 Sam is aiming to complete her Level 3 diploma by March 2019 whilst developing into a new role within our sister company, GFP Tools Ltd.
“After graduating in 2014 with a Law with Criminology degree, I started work at Cube Precision. I have since learned a great deal about the engineering industry, and with the help of both my managers and colleagues at Cube and the AAT, I now feel comfortable performing my Junior Finance Assistant role with minimal input from colleagues. “I feel my experience of working within Cube Precision has been invaluable and has given me the right grounding to enable me to achieve the results I have so far on my AAT course. “By mixing both what I have learnt on the qualification, and what I have learnt about day to day life in the accounts department of a business, I feel I have gained a good all round knowledge to take forward into my new role at our sister company GFP Tools Ltd.
Sam’s dedicated approach continues to shine throughout her training and development, and we are delighted with her success. Her story has really shown the positive impact of team development for our business. The investment has not only benefited Sam, but it will also benefit our clients by sharpening our ability to provide a better quality service to them and help our business to continue to run effectively.